The Kathmandu Post sits along with Indian newspapers on the desk of the officer who mans the Seema Suraksha Bal (SSB) outpost at the India-Nepal border at Rupaidiha near Bahraich in Uttar Pradesh. 'Fuel rationing begins' is the top headline of the Nepali newspaper. "The (Nepali) government has imposed a rationing system for petrol and diesel, effective from Monday as fuel shortage has gripped the country following Indian blockade on essential supplies to Nepal," the first paragraph of the story reads. "I must know what is happening in Nepal," says the officer. Indeed, he must. The SSB camp overlooks the National Highway 28 with a queue of hundreds of oil and gas tankers waiting to enter Nepal. Most of the their windshields are coated with dust - they have been standing here for some time. "I have spent three days here and I don't know for how many more days will I have to spend here," says Dilip Singh, an oil-tanker driver, as he cooks some rice on a stove besides the highway. The registration plate of the truck indicates its from Madhya Pradesh. Some 20 metres to the left of the SSB camp is an orange gateway, beyond which a score of Madhesi men and women squat on the road to Nepalganj on the other side of the border. They claim they have stopped the trucks, carrying fuel and essentials like food grains and vegetable, from entering the country. "Nepal runs on oil and gas from India. 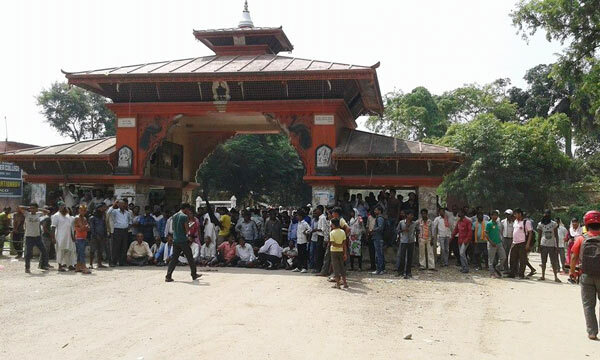 And we will stop their supply until our demands are met," says Pashupati Mishra, a Madhesi leader. "We are being persecuted. Madhesis cannot get jobs in the Army, the police or any government departments," says Mishra. "Now our businesses are also being snatched away." Madhes is the southern part of Nepal - a strip of plain land, with a breadth of 20 kilometres on an average, running east to west. Madhesis say Nepal's new constitution hurts their interest. Barring one, the seven provinces that the new constitution draws up run from north to south of Nepal. That would split up the Madhesi population, reducing them to a minority in most provinces. Madhesis fear they will be dominated by those from the hills. "Nepal should be divided horizontally. But they want to divide the country vertically. Our main demand is Madhes should not be divided at all. We can agree to two states in Madhes at the most. But six - not at all," says Mishra. Madhesis also want representation in Parliament that is proportionate to the population of different religions, communities, castes and tribes. Groups like Terai Madhes Loktantrik Party, Sadbhavna Party, Rashtriya Samajwadi Party Forum and Sanghiya Samajwadi Party have come together against the new constitution. The protesters claim they represent all sections, religions, castes, communities and tribes of Nepal. "We are chocking the supply of essential goods from India into Nepal. And we will continue to do so until our demands are met," says Kaushal Kishore Mishra, a Madhesi activist. He talks about how Prime Minister Sushil Koirala had once urged New Delhi to stop essential supplies during an agitation he was heading against the then Nepali government. Sandhya Deb, a former parliamentarian, says: "Once India stopped supply of fuel, people had to cook using wood meant for burning the dead. The situation will be the same if the new constitution is not amended." Already, demonstrations have started in the hills against India. Nepali cable operators have taken Indian television channels off air -- although reports are that the government has asked them to restore them with immediate effect. The tension is palpable at the Bahraich border. As the crew of a local news channel tries to film the squatting Madhesis, a Nepalese police officer asks them in Hindi whether they are from Nepal or India. "India," someone replies. "Have you taken permission to shoot in a foreign country?" the officer, sporting a crew cut and a dark shades, asks them curtly. Later he cools down. "We do not have any grudge against you. But Indians had misbehaved with some Nepali journalists filming the line of trucks on that side. If we allow you to shoot, those journalists will complain against us to our seniors," he says. When the TV crew expresses a desire to visit the interiors of Nepalgunj, they are dissuaded. 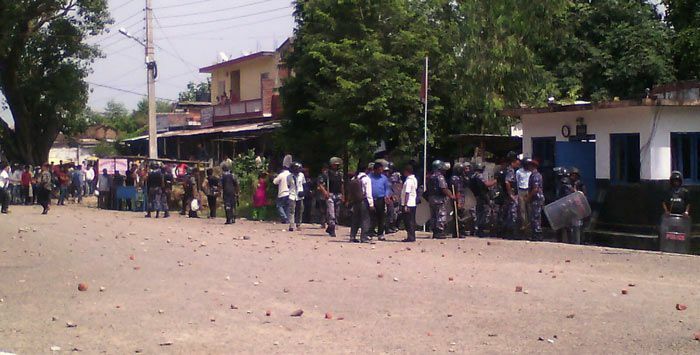 "Their is a wave against India in the interior of Nepalgunj. You can be attacked," says Shakuntala Devi, who sells cigarettes and bottled water on the Nepalese side. She is a Nepali, but her daughter attends school in India. The blockade, which has been there for some 50 days, has started having an impact. An LPG cylinder, which would normally cost about Rs 500, is now selling for 10 times that amount. 'Nepal mulls flying in fuel to beat blockade', reads a headline in Kathmandu Post. 'India hints at resolution after Modi returns', 'Negotiation with dissent parties begins' and 'Protests rage across country against India's blockade' are the other headlines. Is the blockade really Indian? How can 20 Madhesis stop so many trucks? Indian officials says the situation in Nepal is on the boil. Indian trucks drivers may be attacked and the vehicles torched. Officers from several Indian agencies are keeping a close watch on the happenings. "When the Nepali police informs us the situation is safe, we allow a few trucks to cross the border. We can't allow all of them as the police their would not be able to ensure their protection," says a security official. He denied that any Indian authority has stopped the trucks from moving into Nepal. But the ever-lengthening queue has also left Indian officials jittery. On Tuesday, they decided to allow some trucks into Nepal, but changed the decision as the Madhesi squatted on the road. The protesters want to agitate on Indian soil as well. They wanted to throw stones at the Nepali police from the Indian side, says Chhotak Yadav, in-charge of Rupaidiha police station, the last Indian police station before the border. "Why should we allow any disruptive activities from the Indian soil? I forced them back into Nepal," he says. Between the countries is a strip of land about two metres wide - the No Man's Land. "The Madhesis can protest there," Yadav says. The police of both the countries are reluctant to take any action in No Man's Land. But the Madhesi protesters allege the Armed Police Force, a Nepalese paramilitary force, fired at them and caned them even on No Man's Land on Saturday. Though the trucks stand still, there is no let up in the movement of people across the border. The road in front of the SSB camp has disintegrated, raising dust even if a bicycle passes. From the Indian side men carry sacks of potatoes on bicycle carriers. Women with spinach come from the other side. Both try to dodge security and custom officials. Security officials start chasing them and feel their bags for narcotics or any contraband. From his glass cabin the SSB officer monitors the road and the people. But it is difficult for him to tell an Indian from a Madhesi. READ NEXT >> Oscar dreams: I&B to promote films abroad, but is it enough?